This is, what you might call the perfect sundowner. I’m sitting on the chaise section of my lofty Galaxy Sanctuary, a vast living space cut into the side of a mountain with no fourth wall. Just an open space to the rainforest canopy and the Caribbean far below. A freshly made gin and tonic delivered by Emerson my personal butler awaits on the table. A bowl of nuts is within nibbling distance. The Pitons sit unobstructed like twin silent sentinels on one side; the lush tropical landscape of Anse Chastanet on the other. A sailing boat slowly drifts across the horizon while the sun behind it gently melts to red. I realise I’ve stopped breathing. This view is extraordinary. I take a breath. I sip my drink. And I say a silent prayer. 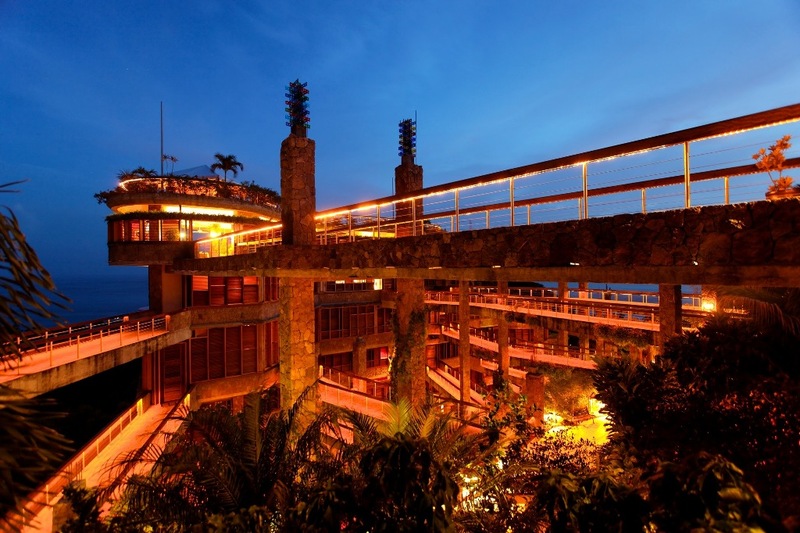 Jade Mountain is not so much a resort, more a work of art. 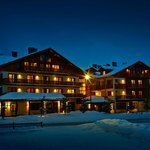 It is an astonishing experience and arguably one of the most spectacular resorts in the world. The brainchild of Russian-Canadian architect Nick Troubetzkoy who together with his wife Karolin have hands-down created a masterpiece. 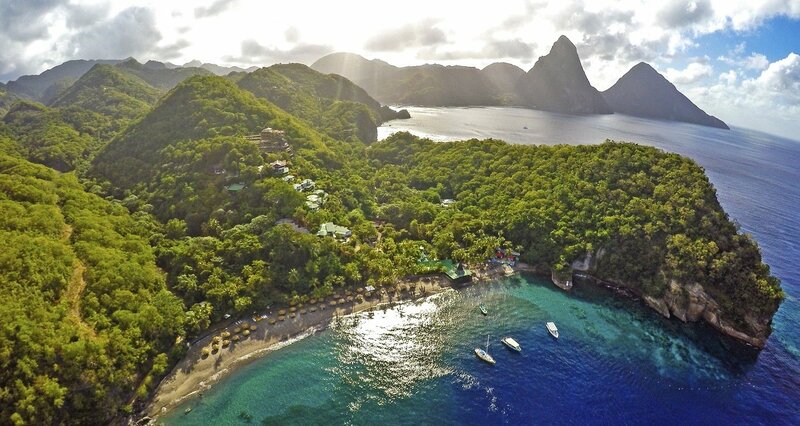 Jade Mountain together with its sister property Anse Chastanet shares a very exclusive 600 acres of the Mont Chastanet estate, a slice of tropical heaven in south-west St. Lucia that leads down onto one of the best coastlines on the island. Almost within touching distance of the Pitons just outside Soufrière. While both resorts are luxuriously adults only, Jade Mountain is the undeniable star of the show. Built from scratch with Troubetzkoy micro-managing every building ingredient, it’s the ultimate retreat for high-enders seeking tranquillity and luxury. Just 29 separate sanctuaries, each one individually different but gaining in size and stature as the elevation increases. There are five size categories starting, ironically, with Sky on the lower hillside then ever-upwards with Star, Moon, Sun and Galaxy, the kingpin, at the top of the pile. 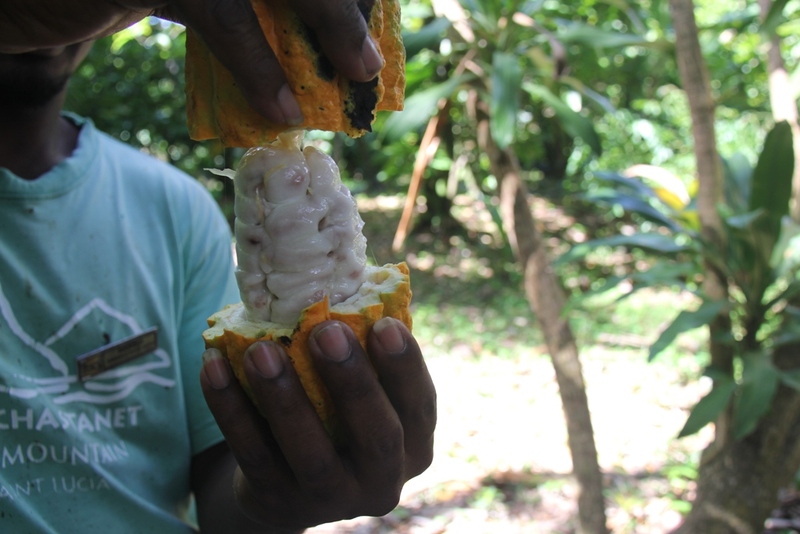 Each one offers an open panorama to the rainforest; a real sense of being at one with nature. And all but the five Sky sanctuaries have their own infinity pools. There are no televisions or radios to disturb the serenity, though there is wifi. And surprisingly, but understandably, no air conditioning; just an army of large ceiling fans. But that’s where the compromise ends, for there is no doubting the craftsmanship at work here, or the extent of the furnishings and features. 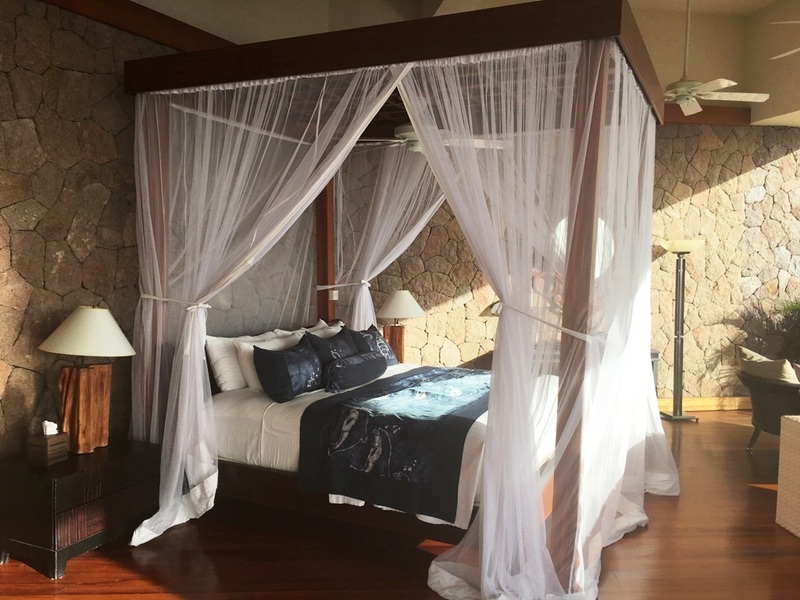 20 different species of tropical hardwood flooring, a king-size four-poster bed draped with delicate netting, top quality coffees and teas, snacks in the fridge, Molton Brown bath amenities, Frette towels and bathrobes. And, sitting on a raised dais, a whirlpool tub with adjustable jets and multi–coloured lighting. Each sanctuary is assigned its own butler who can be summoned day or night by the press of a personalised mobile phone.Yours for the duration of your stay. With paperwork completed and dining arrangements agreed, he silently slips away leaving me in splendid isolation; just the sounds of the rainforest and the gurgle of my infinity pool for company. 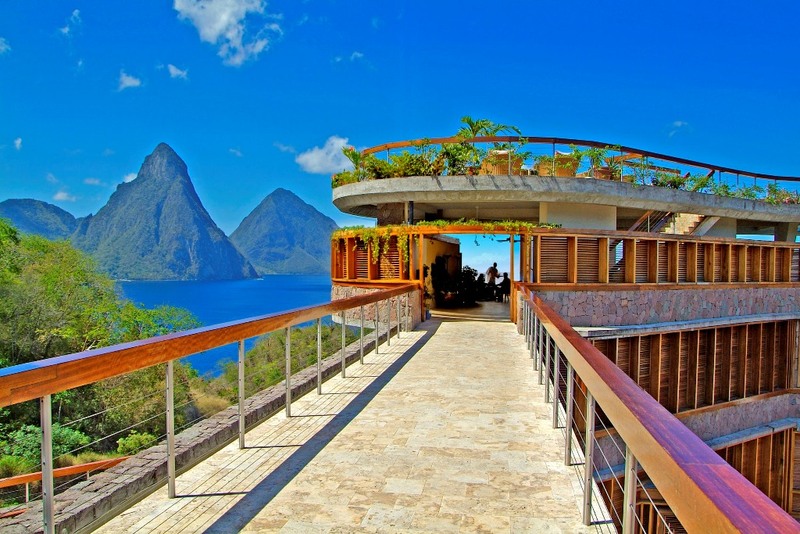 I make a mental note to visit Anse Chastanet’s four restaurants of course, but for now, the exclusive Jade Mountain Club awaits. 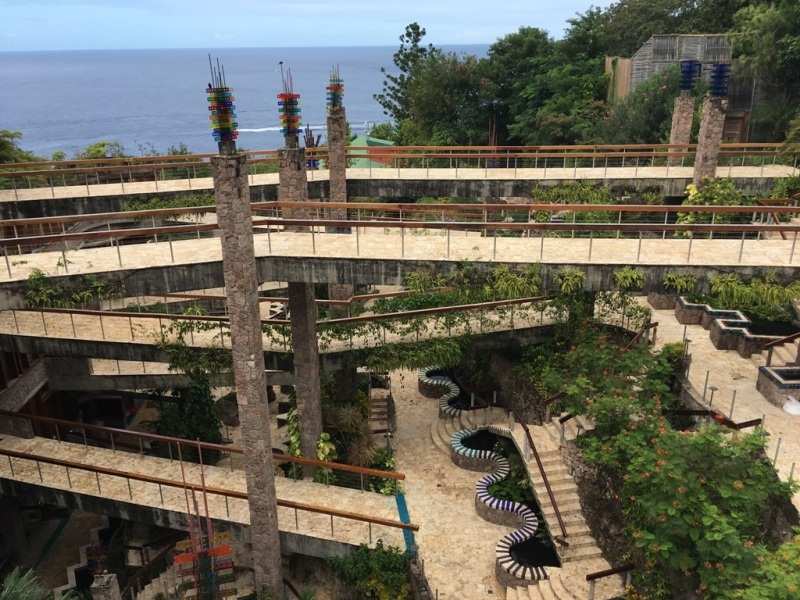 All the various levels at Jade Mountain are interconnected with an intricate series of bridges, paths and steps which makes for yet another fascinating landscape, only this one is Troubetzkoy-made. Just a hop or two up from my already lofty Galaxy suite, it is heavenly on just about every level. I get a table at the front, the lights of Soufrière twinkling far below; the Pitons shrouded in inky black. Up here even the food has its own name; ‘Jade Cuisine,’ courtesy of James Beard award-winning chef Allen Susser. It’s fresh, seasonal and authentically tropical fare with contemporary twists from Susser’s magical book of culinary spells. Delicate mahi-mahi ceviche with lime and coriander was a stand out for me washed down with a chilled Sauvignon Blanc bursting with flavour. It’s a generous all-inclusive menu with more than enough quality wines and spirits for my palate. Comfortingly, anything not included is clearly marked, leaving any guest who wishes to sip a premium Cognac or two in no doubt as to who foots the bill. Back in my sanctuary, I’m reluctant to sleep. It takes on a new magical hue far too inviting to miss through slumber. Soft lighting, my pool a colour of my own choosing and a chorus line of cicadas and tree frogs composing a symphony below my balcony. I wake up to the sun and the sound of birdsong. A few gaily coloured feathered friends have spotted my half-empty coffee creamer carton from last night and between them are breakfasting on the remaining liquid. 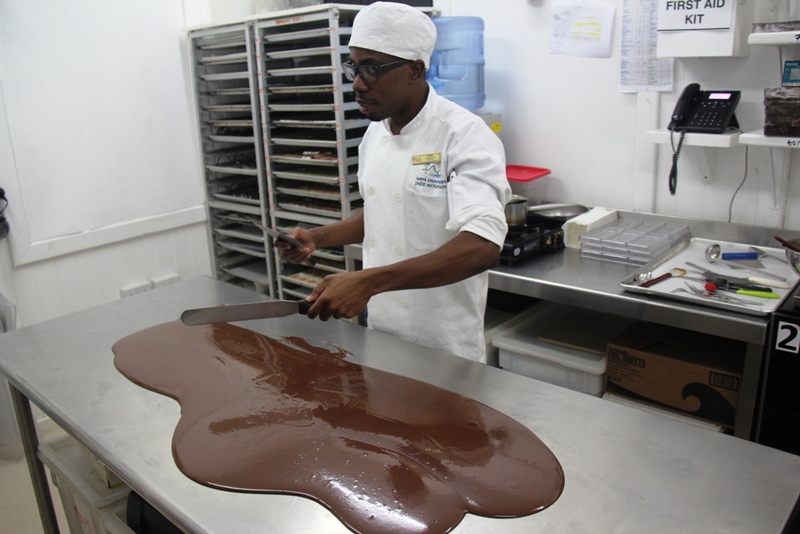 Today I have a lesson in the Chocolate Lab with Peter, Jade Mountain’s own chocolatier who hand-makes every piece that is consumed or sold. But first, it’s a visit to Jade’s own Emerald Farm to see the dark stuff growing naturally. I meet with Martin who has literally grown up here when this was once his grandfather’s farm. I’m in the Lab with Peter who is surrounded by racks of homemade dark chocolate. I am seriously contemplating diving in head first but get distracted by Peter giving me a pastry knife. “we’ve melted the chocolate now so you’re gonna spread it all over this table. It’s called tempering. It gives chocolate a real shine.” Never mind all that, it just gives me an urge to lick it all off. I somehow manage to stifle my urge long enough to create some delicious pieces of confectionary under Peter’s expert tutelage. We wrap them and box them and I have my first official souvenir. 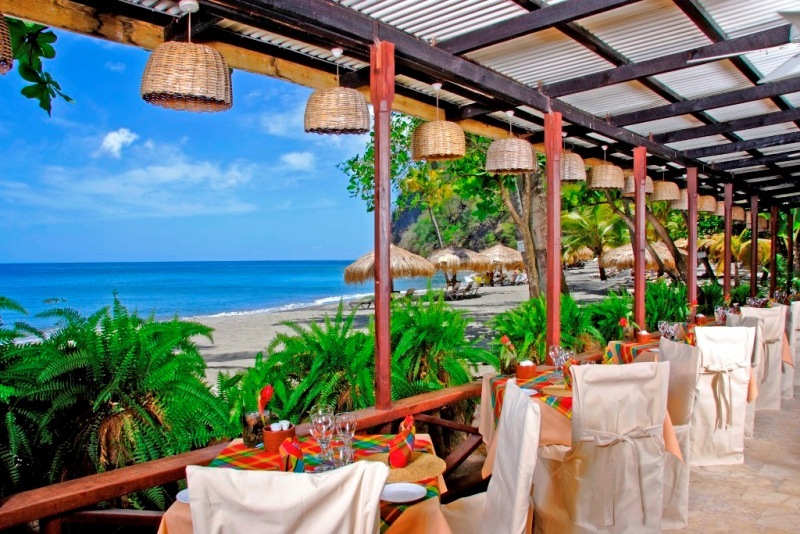 Lunchtime now and I stroll down to Anse Castanet’s Trou au Diable Beach Restaurant to sample some surfside food and a few drinks from the lively bar. It’s quite an adjustment from the peace and tranquillity of Jade Mountain but an excellent spot for people watching. 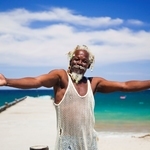 There’s a dive shop close by and much of the chatter is of scuba and snorkel adventures.The restaurant has a Creole-inspired menu at lunchtime but in the evening transforms into Aspara, a Saint Lucia-East Indian fusion menu. It’s full of exotic Indian dishes like Ajwaini Bhed – crushed lamb cutlet with chickpeas and garlic pickle, and Haryali Batakh – tamarind-roasted duck breast, cumin crushed breadfruit and curried soya with coriander. There’s a protected marine reserve right by the resort, a perfect habitat for snorkelling and late afternoon I’m told, the tropical fish are all out on parade. All snorkel equipment is included in the package so sampling some underwater fun is a no-brainer and it certainly lived up to the billing. By the time I return to my sanctuary, Emerson has weaved his magic and there are some snacks in the fridge and a cool bottle of something bubbly sitting in an ice bucket. I cant think of a better way to end a day. 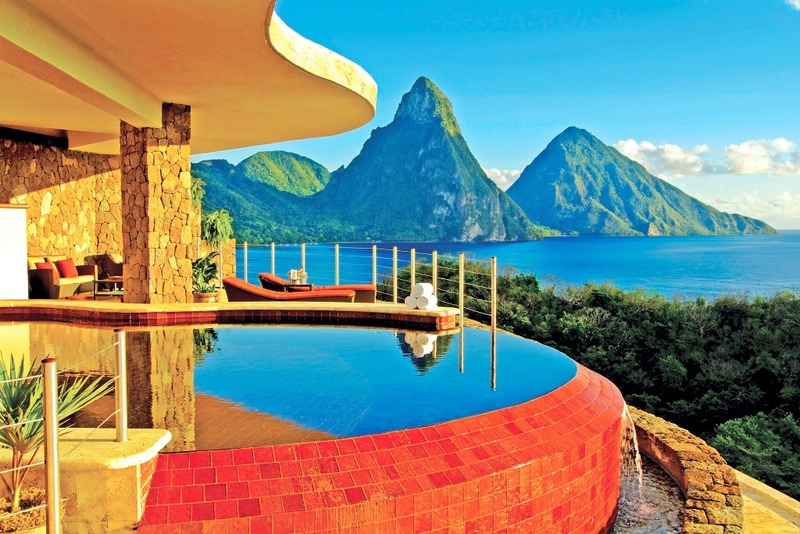 Jade Mountain Resort is a very special luxury experience. Just remember to breathe and brush up on your silent prayers. 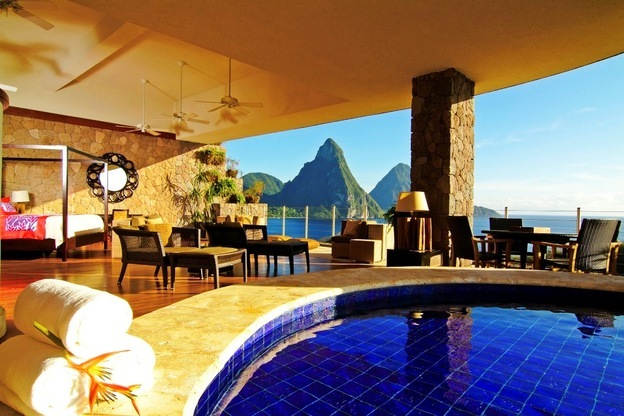 Nightly rates at Jade Mountain start from $1,080 (£824*) per sanctuary based on double occupancy. Rates are subject to 10% service charge and 10% VAT *Prices in pound sterling accurate on the date of publication.